Jason Cummings took what proved to be the final kick of Terry Butcher’s tenure as Hibs manager two years ago. The striker’s failure to convert from 12 yards was the decisive moment of the penalty shoot-out against Hamilton Accies which consigned Hibs to relegation and effectively sealed Butcher’s fate in the Easter Road hot seat, but the big Englishman retains nothing but fond memories of Cummings, the mere mention of the 20-year-old’s name bringing a smile to his face. 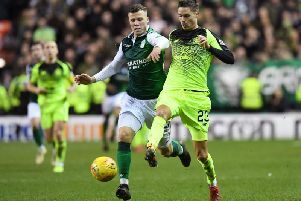 Butcher will be at Hampden on Saturday for what he believes could be a classic Scottish Cup Final between his former club Rangers and a Hibs side looking to end their tumultuous season on a high note after coming up short in both the League Cup Final and their quest for promotion. If Hibs’ Scottish Cup hoodoo is to be finally laid to rest, Butcher regards Cummings, pictured below, as the most likely match winner. “He thrives on big games, as his scoring record against Rangers shows,” said Butcher. “He loved the derbies against Hearts as well. “Hibs have proved they like the big games this season, beating five Premiership teams in the cups. “It has the makings of a cracking final. You wouldn’t think twice about Jason missing a sitter and then scoring an absolute belter from 35 yards to win it in extra time. Those are the kind of things he can do. “As a manager, it’s nice to have someone like him in your squad. With more experienced players, you know they are going to do this or that. But Jason has that extra bit of excitement, that devil-may-care attitude. You think ‘why’s he doing that?’ and then you are shouting ‘great goal!’. “That’s one thing I do miss – being at Hibs with him. You just don’t know what he is going to do or say. You just laugh at him, because he is a real character. “I know there are a lot of clubs down south watching him. No-one has spoken to me about him but I would have no hesitation in saying what a great guy he is. “He’s bubbly. He’s a clown but he can be a genius. He’s not as mad as Paul Gascoigne and I’d never liken him to Gazza as a player. But he’s a real character. “Jason believes a lot of things, some of them nowhere near the truth. You can call him a Walter Mitty, but you also call him a genius. “He does things extraordinarily well. He scored two goals for me in the play-off final at Hamilton, one a screamer. Then he missed the penalty which sent us down in the second leg at Easter Road. You can’t help but love him, though. He’s a loveable rogue. You want to see him do well. He works his socks off. “A lot of people talked about his Hearts connection as a kid, said he liked Hearts better than Hibs. He’s had to prove more than a lot of other players that he wants to do well for Hibs. And he has. “Jason doesn’t overthink anything. A lot of more experienced pros would never say some of things he does in public. But he just says what he thinks because he thinks it’s funny. “A lot of what he does is instinctive. He can score screamers, mis-hits or tap-ins. He can miss unbelievable chances but he always goes back for more. Nothing fazes him. “He is a confident boy. I gave him his full debut and he never let me down. He will do things in games which are remarkable. He makes good runs, holds it up well usually and works hard to get it back when he loses it. “He is a bit unpredictable but you do know you will get honest effort from him, which gives you half a chance. He is a natural goalscorer. “He was out on his feet in extra time in the second leg of that play-off. He went from the high of scoring two in the first leg to missing the penalty in the shoot-out. I never got the chance to try and pick him up afterwards – I only saw him the next day to say ‘see you next season’ but I never did! Butcher’s only shot at Scottish Cup glory during his brief tenure at Hibs saw them suffer a 3-2 home defeat to Raith Rovers in the fifth round. He was acutely aware of the significance of the tournament for the club. • Terry Butcher was speaking at a William Hill media event. William Hill is the proud sponsor of the Scottish Cup.